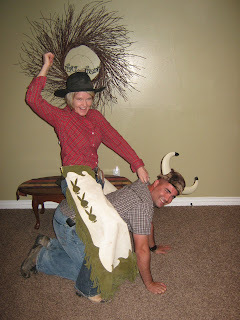 We had fun this Halloween. It always makes it so much better when the weather is good. 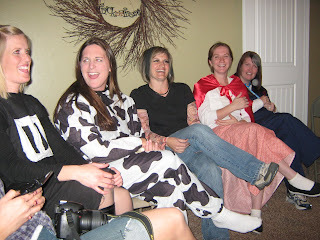 We partied hard the night before and then we headed to Kanosh for Halloween. 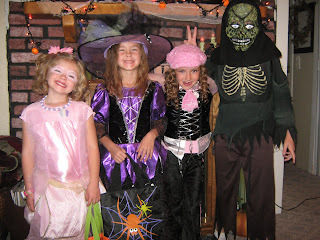 I got all the kids new costumes this year and only Cadence and Brylee wore theirs. I had to get a picture of Taylee. 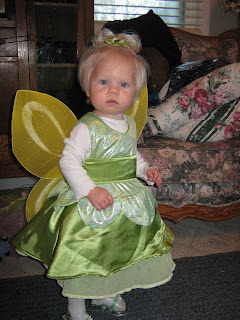 Her Grandma made her this Tinkerbell costume. She is so adorable. I think Aspen has worn this costume for the last three years, but so looks so dang cute in it. It's by far her favorite. 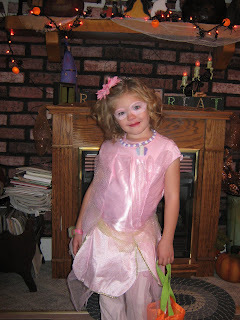 Here's sweet fairytopia Cadence sporting her fairy costume. 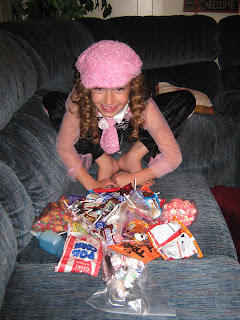 She was such a riot taking trick or treating. There is never a dull moment with her around! 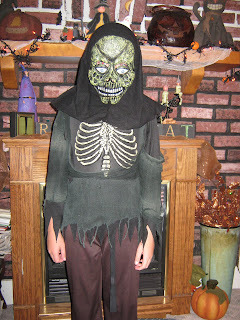 This was Kyler's costume from last year, but he never wore it. It scared his sisters too much. They weren't as scared this year. He loves scary costumes. 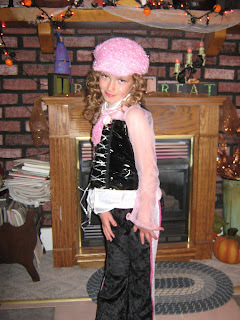 Here's the Bratz Diva Brylee. This costume fits her perfectly. She is so cute. 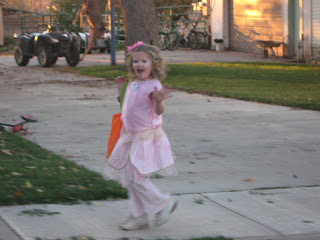 Cadence kept waving to us while she was walking from house to house. It was hilarious! 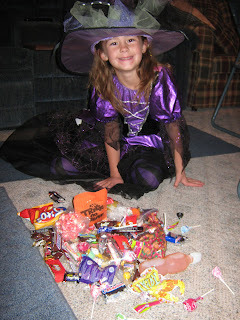 This is how much candy Brylee got. We only went out for about one hour. Kanosh Rocks! Here's Aspen's stash. Oh no here comes the cavities! Every year my parents, uncles, aunts, and grandpa give hot dogs, hot chocolate and punch on Halloween, instead of candy. They build a bonfire and everyone in town comes to feast. Yummy! 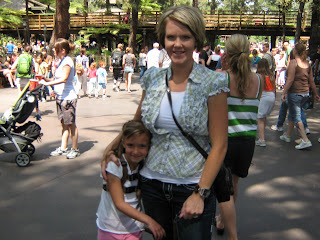 Here's Natalie and my sister-in-law Melanie. 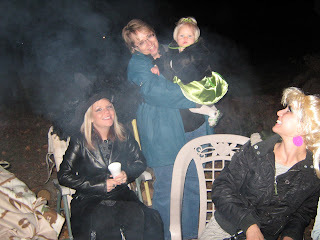 Stacia, her mother-in-law Stacy, Taylee, and Nat, all enjoying the nice smoky fire. 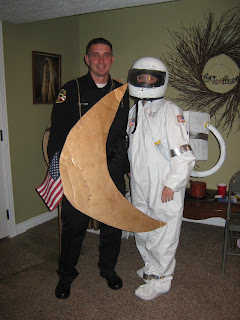 This was such a fun Halloween. It was so nice that the kids are finally old enough to go to the door by themselves. 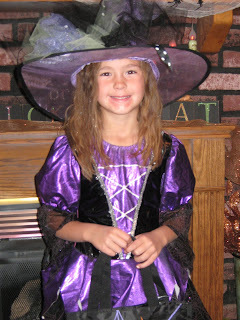 It was so fun trick or treating. The best part is picking out what you like in all four treast bags. Oh yeah Halloween is awesome! 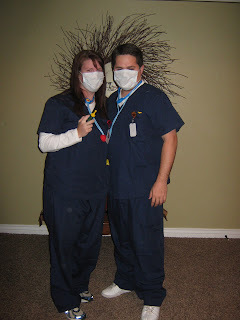 So we had our annual Halloween party. It was a busy night, but we made it! 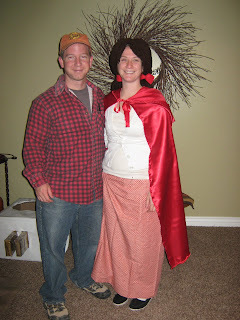 We had some great costumes, and this year we gave out prizes, which was really fun. 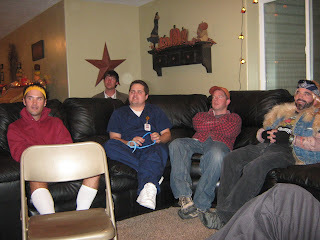 The guys weren't too happy about playing games, but they were pretty good sports. Looks like they're having a blast right? We were winning, which always makes us happy, but the guys won this game. You have to let them win some so they'll keep playing with us. 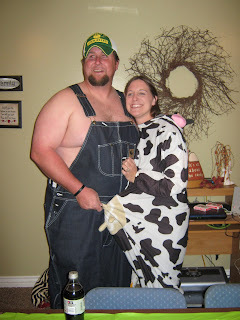 Here's our first place winners, Michelle and Shaun Hunt. 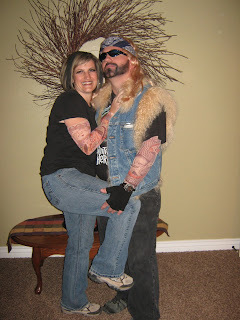 They looked rockin! Our second place winners, Keri and Jordan Hennefer. Way to be creative! And our third place winners, Justin and Leilani Zufelt. Out of this world! And the hosts of the party. Bring it on! Look at this Hot Couple, Carter and Tammi Miller. You guys were a little too high class for us, but great job Jake and Natalie! 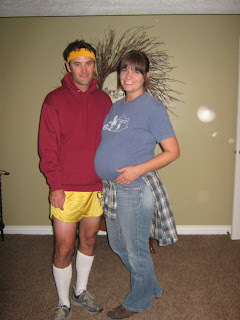 The Juno couple, Tyler and Susie Knudsen. Thanks for coming even though your husbands couldn't. You looked great! 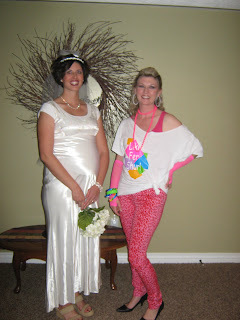 Jennifer Mcune and Kim Dowdell. 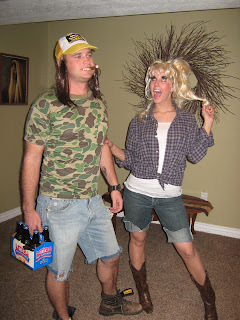 Great costume guys! 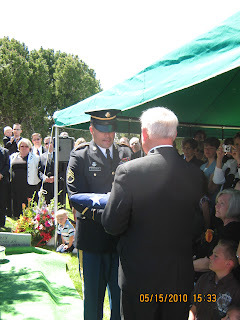 Jason and Caitlin Robison. They mean business! She's ready to shoot! Krista and Sam Dodd. Thanks everyone for such a fun time! You all did Awesome on your costumes! 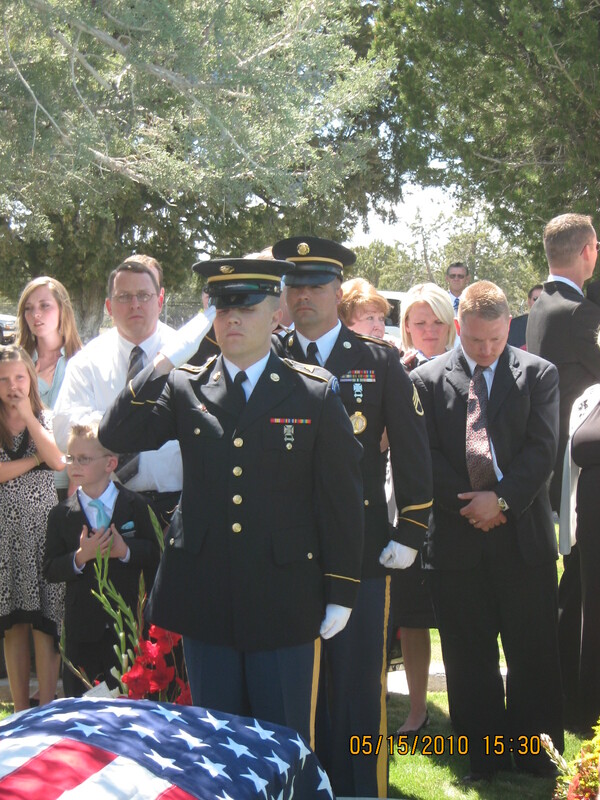 Brent went to Germany with the guard to train some soldiers for three weeks back at the end of August. He had to grow a beard the whole time. 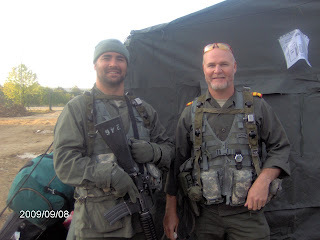 This is Brent and one of his fellow recruiter buddies Sapper Shane Johnson. 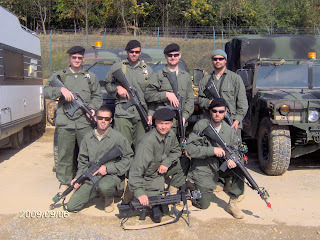 This is the group of guys that he was with out the the field. 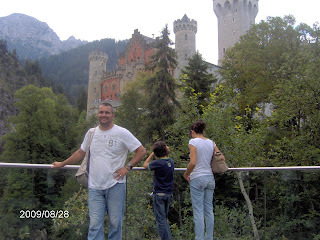 He only got to tour Germany one day, but he was able to visit a few castles. He looks gorgeous there. He loved it. 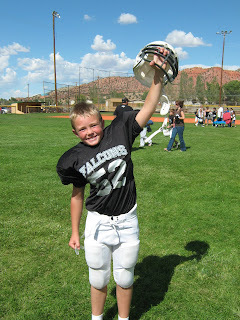 This year Kyler played tackle football. His team was the Falcons. He really did great and he loved it! He ended up being really good. We thought it would toughen him up a bit, yeah not really. He got to be on the same team as his cousin, but i forgot to get a picture of them together. 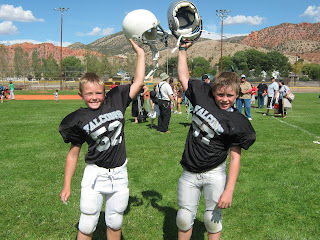 Kyler and his bud Porter Miller after defeating their rivals, the cedar redmen. Okay so I know i haven't been the best blogger all summer, but I'm going to attempt to catch up just a little bit. There are so many things that i have wanted to blog about, but i haven't had time so i came across some really cute pictures and so i had to at least post them even though they're 3 months late. In Kanosh they have the funnest 24th celebration. They do a really fun parade, where the kids get loads of candy, then we have a dutch oven dinner, and tons of races, games, egg toss etc. 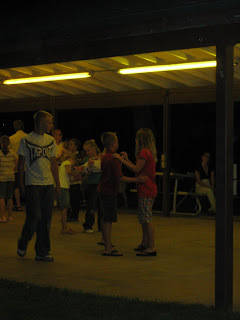 Then we have a family dance with a live band, which is always fun. 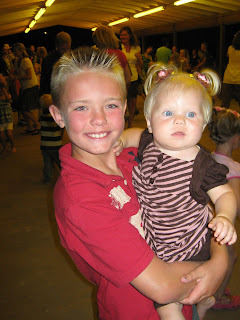 As you can tell, Kyler absolutely adores Taylee so of course he was dancing with her all night. She loves him too. So i caught Kyler dancing with a girl (who asked him)I think he was hoping if he didn't look my way, we wouldn't see him. Yeah right! Earlier he told me that a girl asked him if he wanted to dance, but he said no thank you, and she said ok. He thought nothing of it, until I told him it was rude to say no. I guess i should just let him say no. Maybe it will keep the girls away longer. This is before the parade, but I should of shown how full the bag was after the parade. 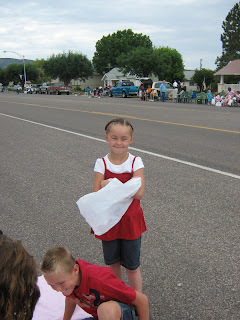 It was nothing like cedars parade where we got like 2 pieces of candy. 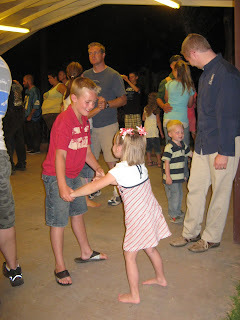 I thought this was cute of Kyler and Cadence dancing. Wow they can have fun and not fight. Rare occasion! Too Cute! I had to blog about this, because I thought it was so cute. Kyler is really a great kid and he is quite sensitive. Sometimes when I get I little overwhelmed with everything I break down and lose it, and I always end up crying and then feeling like the worst mother in the world. Well, it was one of those days and when I came in my bedroom to go to bed, this is what I found. 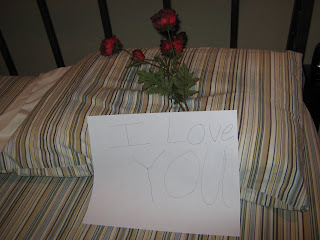 Kyler had turned down my bed for me, put some flowers on my pillow and wrote me this note. 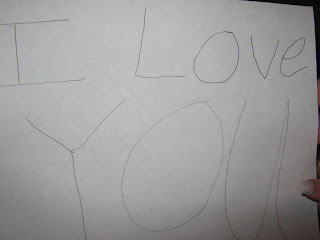 On the one side it said I love you and on the other side was a picture of me and him together. Stuff like that makes me appreciative of the great kid that of have , but almost worse because of the way I act sometimes. How cute is this. 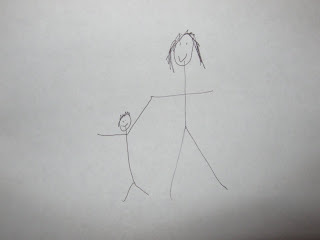 He definitely got his artistic side from me. Those are awesome stick people! I love you Kyler! 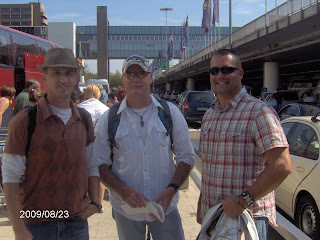 Yeah, i know it's been awhile, but it was summer and I've been way to busy to blog. My blogging time turned into coupon sorting, organizing, and cutting, so no time for blogging. I have been saving lots of money on groceries though. It feels like there's been no summer, but I'm soooooooooooooo glad school is back in. My house is starting to get clean again. YEAH! My computer keeps dying on me, so I'll make this short. We went to Disneyland the end of may, made lots of trips to Kanosh, stayed in cedar for the fourth( which sucked and we'll never probably do again) except for we had some friends over for a BBQ and fireworks and that was really fun. 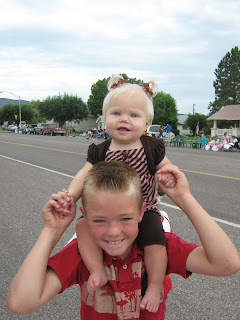 We spent July 24th in Kanosh, which was a blast as always, except for this year Brent wasn't with us. Right now he's in Germany doing who knows what with the military for three weeks, while I'm here fighting kids, and being a chauffeur. Super fun! I'll blog later, when my pictures finish uploading. So, maybe in a week or two. Hope every one's doing well. Good thing I'm not the only one not blogging. Thanks guys for not making me look so bad. 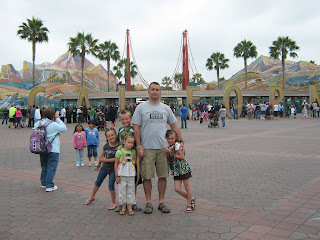 This weekend we took the kids to Disneyland. We had a blast, but were all are completely exhausted. 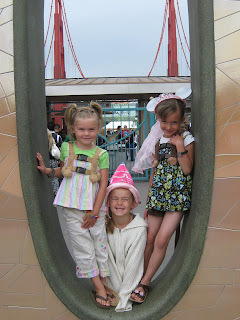 The first day we went to Disneyland and spent the whole day there. 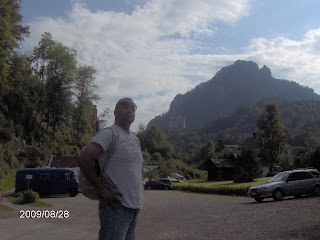 Our intentions were to go for a little while, head back to our room, rest , and then return, but the resting part never happened on any of the days, so we wore ourselves out. 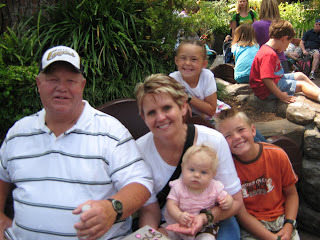 The kids loved Splash mountain and Pirates of the Caribbean. We didn't see a lot of the characters, and the ones we did, the lines were like two hours long. Hence, not too many pictures with them. I'll post a few more later when I get them from Stacia. The second day we went to California adventure land, which was really fun, because it wasn't that busy so we walked on to a lot of the rides. Kyler loved the mail boomer. He went on it like four times. The third day we hit our favorite rides and called it a day at about 2:00. We tried to watch the fireworks that night but it was too windy, so they didn't do them. What a bummer! We didn't get a ton of pictures because our camera stopped working for a day, it got wet on Splash mountain and wouldn't work the rest of the day. Here are some pictures we did get though. 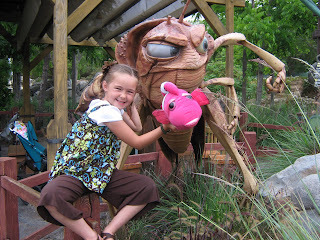 Aspen and her new bug friend, just outside of the theatre where we saw it's a bugs life. It was so funny to watch the kids in this show. We had a blast. 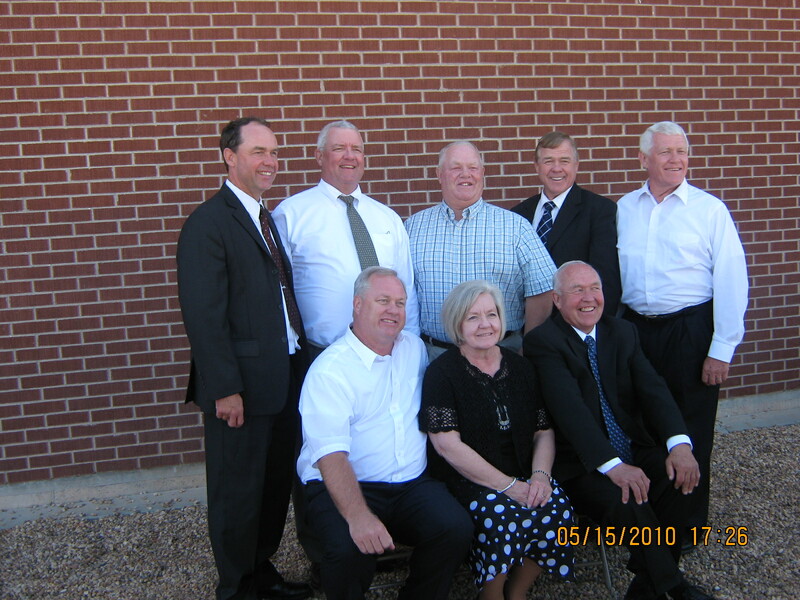 Brent was really laughing, which we don't hear that much. So it was a real treat. Cadence giving me her scared face. 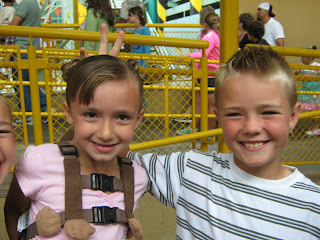 Brylee and Kyler patiently waiting in line for yet another ride. 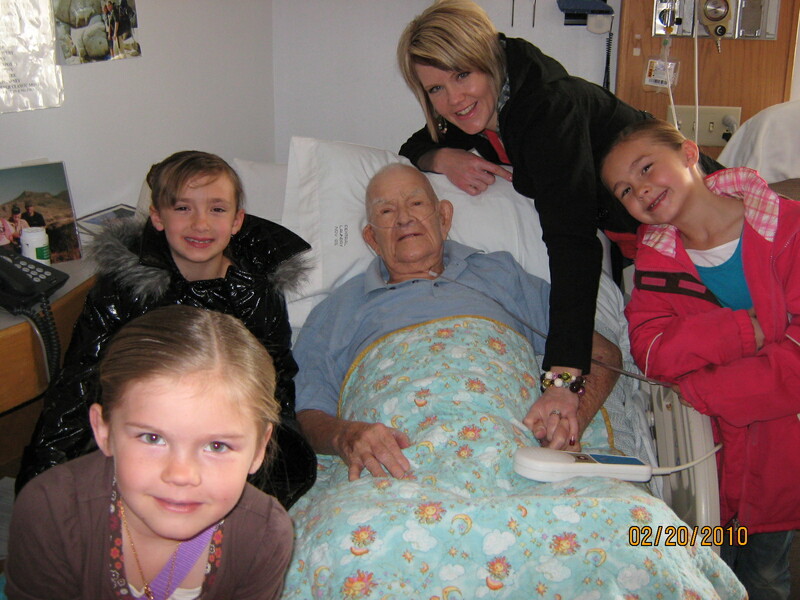 Grandma and Grandpa helping out with the kids. Doesn't Grandpa look so happy to be there! 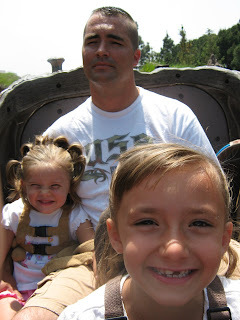 Brent, Cadence and Brylee on Splash mountain. Little did they know what was ahead. 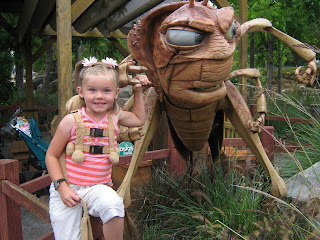 Brylee was scared on almost every ride. 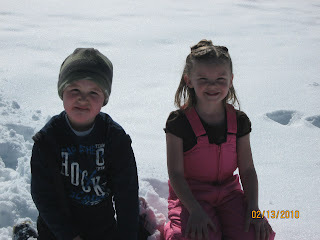 Aspen and Kyler were the troopers. The Happy family heading for more fun in Adventure land. The kids favorite rides were the new toy story and soarin over California. 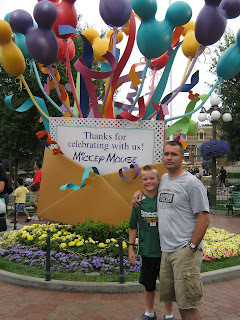 The happiest place on earth, right Brent? Do I look hammered or what? We were so sick of stainding in lines! Who knew you could be so soar from going to Disneyland. This was on our way out on the last day. We sure had fun, but we've had enough. 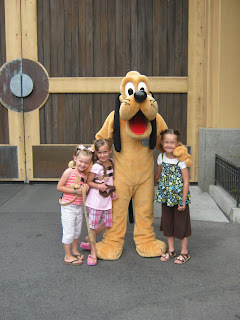 We found Goofy right in front of the Tower of Terror, which by the way was a blast. Kyler is the only one that dared go out of the kids. He was pretty brave. It scared him pretty good though.